Lewis Ritson has moved up in weight to the Super-Lightweight division and will make his debut at 140lbs when he takes on Argentina’s German Argentino Benitez for the WBA Inter-Continental title at the Copper Box Arena on March 23, live on Sky Sports in the UK and DAZN in the US. Ritson ripped the British Lightweight title from Robbie Barrett in seven rounds before making a series of devastating quickfire defences against Joe Murray, Scott Cardle and Paul Hyland Jnr to win the famous belt outright. The 25-year-old Geordie ace makes the jump up to 140lbs after tasting defeat for the first time when he was outpointed by Franceso Patera in a battle for the European Lightweight crown at the Metro Radio Arena in October. With an extra 5lbs to play with, the ‘Sandman’ is confident he will be even more destructive at his new weight and is itching to begin his assault on the Super-Lightweight division in London next week. “I’ve watched the Patera fight back once and I won’t be doing so again. It was a terrible performance and some of the mistakes I made on the night are inexcusable, but you live and learn. “Fanno (coach Neil Fannon) said if I don’t get him out of there in the first half of the fight it would be a hard night’s work but I went in there with the mentality of just blasting him away early, like I had done to the previous couple of opponents which was wrong. It’s opened my eyes and we’ve been working on my all round game since. “You’ll see a different Lewis Ritson with the extra 5lbs to play with. The power will be more telling, we were surprised boiling down to make 135lbs I was getting good kids out of there in that fashion. But that shows I have natural power, which will only show with the extra weight. “To be fighting for the WBA Inter-Continental title opens some doors right away with a win. I didn’t want to be fighting in a six or eight rounder just to feel in to the new weight, or fighting at Commonwealth or British level. That’s no disrespect to the lads up in this weight, but I’ve got the British title on my Dad’s mantlepiece so I don’t really want to be going over old ground. “I’m a million miles away from a World title at the minute, but will be keeping an eye on the Hughes vs. Davies Jnr fight. The European title is something I failed to win, so I would be open to fighting for it down the line if it made sense for all parties. 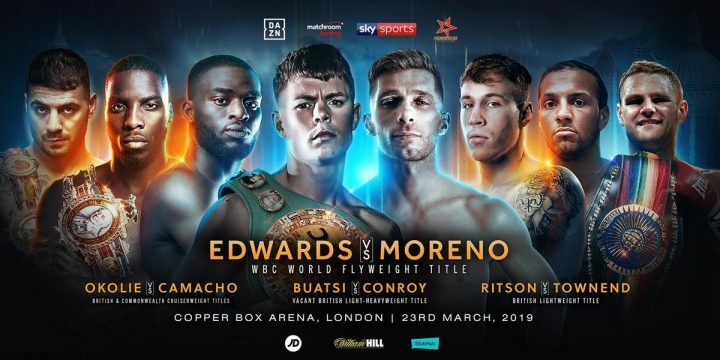 Undefeated Middleweight talent Jason Quigley has been added to the undercard of Charlie Edward’s maiden WBC Flyweight World title defence against Angel Moreno at London’s Copper Box Arena on March 23, screened live on Sky Sports in the UK and DAZN in the US. The Dominic Ingle-trained fighter, based in Sheffield, makes his first appearance in the UK as a professional on a stacked card that features former Olympians Joshua Buatsi and Lawrence Okolie in title action, as well as the return of Newcastle powerhouse Lewis Ritson. A highly-touted former Irish amateur star, Quigley holds a perfect record of 15 wins from 15 fights, with 11 of those wins coming by knockout, since turning over in 2014 and is expected to do big things in the pro game. From County Donegal, Quigley, the current NABF Middleweight Champion, is delighted to be fighting so close to home after basing himself in America for the early part of his pro career. Quigley features on a huge night of boxing at the Copper Box Arena. Watford Bantamweight talent Shannon Courtenay makes her highly-anticipated professional debut and Newport Bantamweight talent Sean McGoldrick fights for the first time under new trainer Jamie Moore.